Hurray! I finally made it to art class tonight! It's actually the 4th week of class, but the first week I had to work, the second week I had a stomach virus, the third week I was on vacation. But finally tonight I made it there. 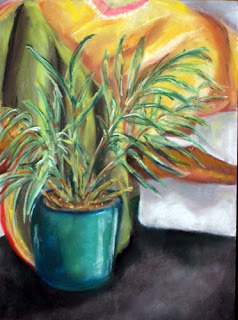 My sweet teacher Alex knew, from my grumblings, that I was sick of drawing the figure and wished we could do something else sometimes - so he added a plant to the composition just with me in mind. So what else could I do but try to do the plant, - though it sure did have a lot of leaves! But he was so busy getting ready for an upcoming student show that it took forever for him to finally get the model in position so we could start, so I only had a tad over an hour to work on this!